Grimes & Fertitta, P.C. 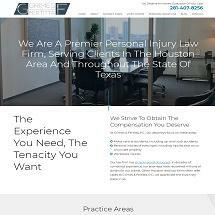 is a civil litigation law firm capable of handling virtually all types of complex litigation. The partners have accumulated expertise in numerous areas of the law. Both name partners have more than 10 years of direct courtroom experience and have practiced with leading senior trial lawyers in a variety of legal areas. After graduation from South Texas College of Law in 1995 both Richard Grimes and Julian Fertitta joined successful insurance defense firms, gaining valuable experience. "Despite the excellent training and experience of handling large defense files, we believed we had more to offer the profession and the clients we would eventually represent." "During the nine years since founding the firm, we have assembled a talented staff and built a technology infrastructure capable of handling the difficult cases, recently adding high end litigation software and other technological tools to enhance data management capabilities and to stay competitive with larger firms. Our firm has grown from a few initial files to representation of more than 400 clients." "We prefer the independence and flexibility of a small firm environment, where we can know our clients well, get very involved in each case, manage them closely with hands-on attentiveness and go the distance in pursuit of the best outcomes for those we represent. Read selected summaries from notable cases we have handled."